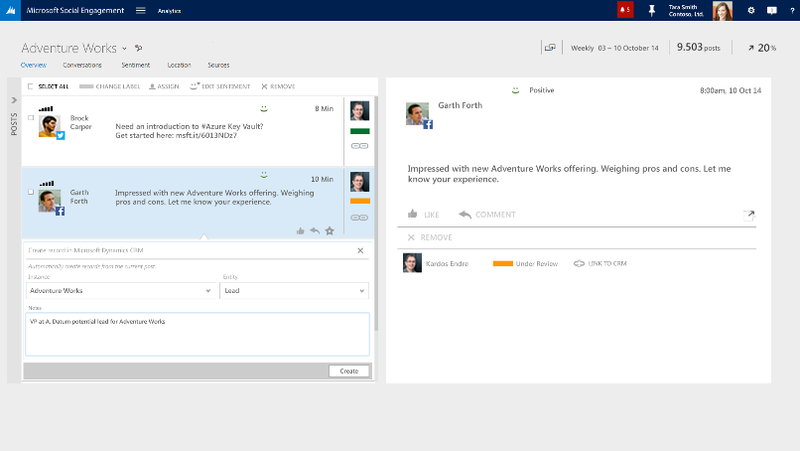 Microsoft Social Engagement 2015 Update 1.2 is ready! We are pleased to announce the release of Microsoft Social Engagement Update 1.2 for October 2015 which will be ready soon. You will receive an email notification on when the service will be updated. You can transform social interactions into an end-to-end experience between Dynamics CRM and Social Engagement with the ability to create CRM records directly from any relevant social post in Social Engagement. For example, salespeople can now quickly create new leads or opportunities from a social post that mentions their product or brand positively. People working in customer service can proactively create new cases that originate from a customer complaint on social media. Additionally, you can benefit from the extensive workflow capabilities of Dynamics CRM to handle the created records efficiently and increase your business productivity. Through sentiment analysis, we are able to determine how a product, a campaign, or a brand is perceived by people on social media. Previously, we used to calculate sentiment from a static algorithm in a post’s original language. In this release, we are introducing adaptive learning, powered by Azure Machine Learning, which enables you to customize sentiment scoring models according to your business or industry needs. With a few dozen manually edited sentiment values on social posts, the customizations of the algorithms already show results. Since all learnings are organization-based, you can freely choose to reset the values at any time or turn adaptive learning off if the sentiment values meet your organization goals. We continue to add new languages to Social Engagement. For this update, we’ve added Dutch, Finnish, Greek, Norwegian, Russian, Polish, and Swedish. This applies to the user interface as well as to the sentiment calculations mentioned earlier. you’re traveling so you don’t miss any important posts. We’re constantly striving for the best user experience and we optimize when we see an opportunity to do so. In the past three months, we’ve extended the dark UI theme to also support the new Bing Maps that are shown on the user interface. Streams in Social Center now show its owner and allows users to easily get in touch with him or her. To improve the structure of the Settings area, we moved the configuration of Social Profiles to Personal Settings. Additionally, you can now create alerts from the configuration of a stream, or see the data in Analytics. On the other hand, navigating the application with the Navigation-Bar now resets your filter selection. Customer engagement on social media happens 24/7 all around the world. 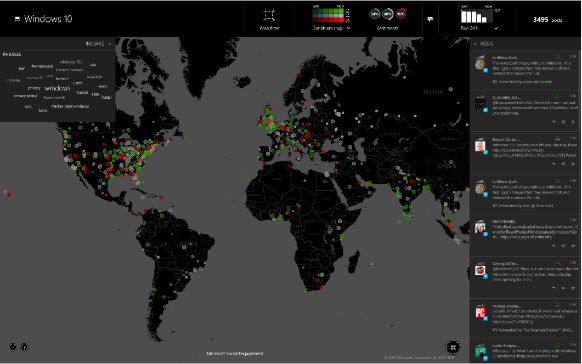 Create real-time maps that visualize the sentiments and newly found posts on an interactive map. Show this map on a large screen (for example at a conference or in your office’s entry hall) to get the most details out of it and impress your audience by showing where the action happens. You can engage with your audience directly from the activity map. It’s now possible to delegate the administration of a Social Engagement solution to a cloud service provider without adding the service provider as a licensed user. In other words, you can work closely with a person of trust to share the work to administer the application. We are continuing to make improvements to Social Engagement to deliver great functionality to you. Stay tuned for more exciting features in the coming months.